Imagine standing on a street while a police car moves past using its siren. You will notice that the pitch of the siren rises as the car approaches you and then drops as it goes past. 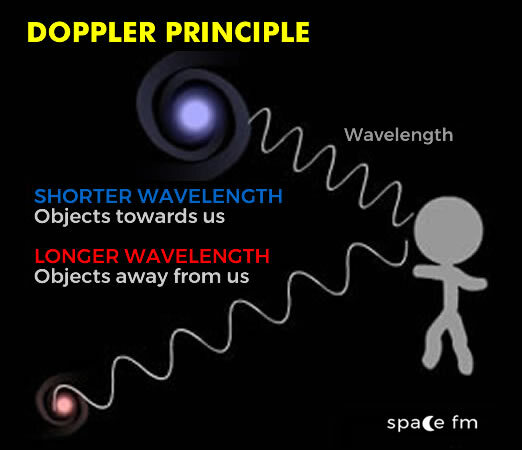 This is called the Doppler Effect and it is the same principle that helps us measure how galaxies move away from and to us. Some galaxies appear to have more red lines in their spectrum. Red light operates at a longer wavelength and means the object showing the red light is moving away from the observer. These objects are said to show a redshift. Blue light has a shorter wavelength and means the object is moving nearer to us. These objects are said to show a blueshift. The majority of galaxies show a redshift meaning they are moving away from us and each other. There are some galaxies that have a small blueshift, meaning they are moving towards us. These are galaxies in our Local Group. The Andromeda galaxy is travelling towards us and will eventually collide with ours in billions of years’ time. Radial velocity is how fast an object is travelling in the direction of the line of sight. When an object moves (Solar System object, star or galaxy) we can measure changes in its spectrum. These changes are known as Doppler shifts and will show redshift (or/and blueshift) and from that scientists can deduce velocity. How do we know that light from distant galaxies is shifted to longer wavelengths? Do we know that all galaxies are moving apart? How can we tell either way? Las Cumbres Observatory What is Redshift?